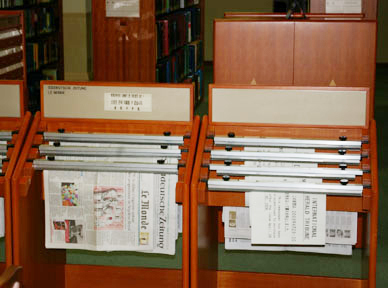 The International Material Division, located on the 2nd floor, strives to deepen the public's view of the world as well as assist the public in their research. The Division acquires library material from Asia, the United States and Europe as a means to contribute to international exchange activities of civic group and other organization as well as to provide information to foreigners and foreign students studying in Fukuoka. Much strength has been placed in the collection of library material of Asian origin from such countries as China, Korea, Vietnam, Cambodia, Laos, Indonesia, Malaysia, Thailand, Nepal, India, Iran and Israel. 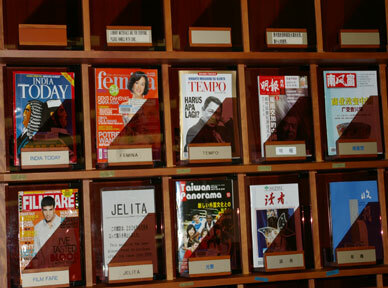 Focusing on Asian library material but also including material from the United States and Europe, the Division, as of March, 2011, maintains 17 foreign newspapers from 17 nations and 51 foreign magazines from 15 nations. As of March, 2010, the Division maintains 63,083 foreign books located on the 2nd floor.